At GoogleIO, Google Photos was unveiled. The app features uploads of up to 16 Megapixels, making instagrams shy 612×612 minuscule resolution rather “weak.” Sporting a 6144×4912 Resolution will make everything you ever shoot on a camera a challenge we’ll all accept in the future as devices gain more advanced cameras. Or if you own a fancy one now you can take advantage of the feature as the app features UNLIMITED Web storage instead of using your devices. Another feature is 1080P video uploads but that is common on YouTube – Up to 4K. The app can recognize people, has a search function, displays media on a pinch time format, and it is launching later today for PC’s, Web, iOS, and Android. A web browser works by communicating directly to someone’s web server. You send a search to Google and Google sends you back your results. It’s a one way road. And this is why websites go down and you feel that your internet is slow sometimes. When there’s too many people trying to download, say The GTA V pre-load for Steam – download speeds slow down to handle the amount of traffic. Today we use Peer to Peer technology to share files across the world using torrents. To do this – a person creates the first “seed.” It’s like a small drop in a glass of water. When a person chooses to download this file, and they choose to reupload the “seed”, the drop gets twice as big. Now there’s 2 seeds in a “pool.” If the speed is the same on both connections you can download the file twice as fast then as if with only one seed because you are using two “servers” instead of one. This is the concept of Project Maelstrom. It uses your computer as a keeper and distributor for sites you visit through their protocal bittorrent://website.com and it is going to revolutionize everything about the current state of the web except one thing.. I’d like it to be just bt:// instead. This new idea means truly private and high customization of social networks with no outsiders able to join unless you grant them access to your website bt://file. It means you can create ranking lists for every seed file uploaded and then decide what you want to do with it… Make a Blackflix to only show TV Shows that have a 9/10 rating, Cortana that works with your browser through your mouse pointer, a website that streams music only if you can prove you are hipster enough by testing you… All of the above and then some more. ★ Join the beta and rule the world! 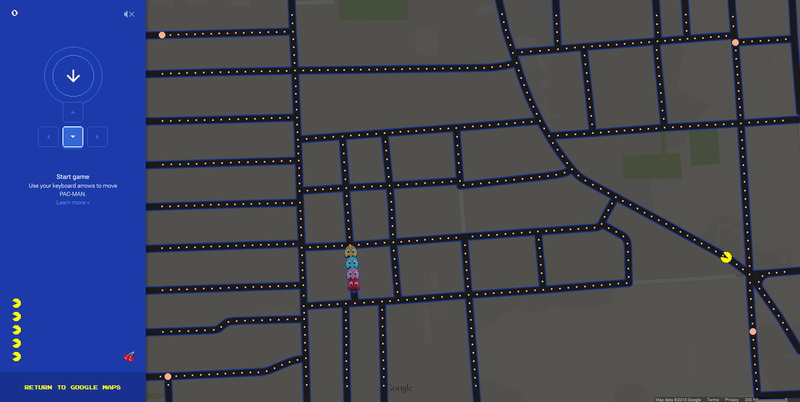 You can play Pac-Man on Google Maps today on your devices and on the web. I just wish this thing was like a real theme for Google Maps and now I can’t wait till we get Minecraft in Twenty Years… After all it is made on Java. That should exist by then right? In like a V/AR version of Google Maps.